This section includes photographs and material from 1990 on Deir Samaan; Hirbet Basatin; the bathhouse at Latrun and the nearby 'villa'; excavations by Jaffa Gate, Old City Jerusalem. There have been huge changes since then. 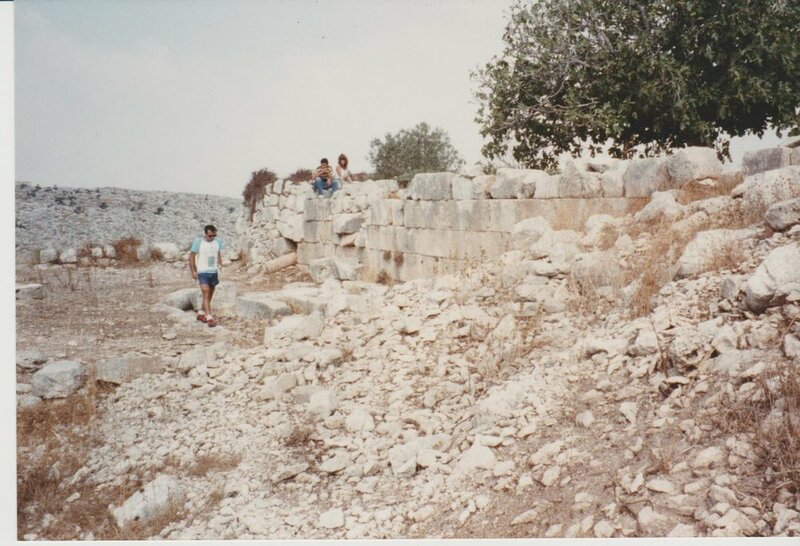 In the summer of 1990, during the Palestinian intifada and shortly after the Iraqi invasion of Kuwait which closed down many travel and research options in the Middle East, I found myself (surprisingly) able to visit and photograph a number of Roman and Byzantine period sites (villages and 'villas') in the Occupied West Bank. There have been enormous changes since 1990 to this contested landscape, and to these sites, notably Israeli domestic construction as part of Israel's settlement expansion in the West Bank, and excavation. Deir Samaan, summer 1990. 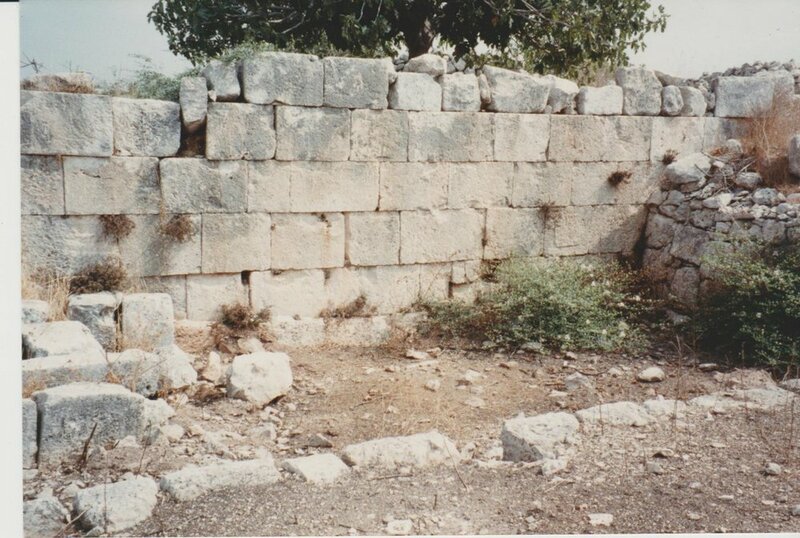 There is evidence of the original Roman construction, Byzantine modification and re-use, and modern uncovering of wall lines (presumably for the purposes of determining a basic plan of the site) prior to my visit of 1990. Credit: Eleanor Scott. ABOVE Roman period ashlar wall, with Byzantine additions visible. The modern uncovering of the Roman wall lines was evident throughout the site when I visited in 1990. The site is reported as excavated by an Israeli team in 1992 (Greenberg and Keinan 2009, site 164). ABOVE Landscape and ancient quarrying at Deir Samaan. ABOVE Right-hand photograph: (from left to right) Ofer Shimon, David Amar, and Palestinian boy from the village next to site (plus donkey). ABOVE Left: me in discussion with Ofer Shimon about how the available basic plan matches (or doesn't) with the archaeology. Right: Ofer Shimon pacing out part of the site; David Amar and Audrey Hamilton look on. In 1990 there were already signs at Deir Samaan of wall clearances, Israeli survey markings and left over pre-excavation equipment (ABOVE and BELOW). In the summer of 1990 I visited the site of the bathhouse at Latrun (near Emmaus) with Richard Harper, the (then) Director of the British School of Archaeology in Jerusalem. The site was being excavated by Israeli archaeologist Mordechai Gihon. The six photographs shown here all date to summer 1990, prior to the main conservation works.